Stampin Carol: A productive day! Today I met with a wonderful group of senior ladies at a local "social" club in Green Valley. They call themselves "Irma's Crafters" and they love to create cards. I presented a short talk on copywrite laws, how to index, mount and store a stamp (in a CD case), and showed 3 cards using techniques I want to teach. What a wonderful response! I could not tell them the company I am an independent demonstrator for (but one lady announced it!) or that I sell products but they all knew. The proposed class is a go! I will submit all the info with the recreational company and I plan on doing the class the 2nd Wednesday of March and another the 4th Wednesday. I will be teaching bleaching, chalk popping, and faux linen for the first class. This card shown here is an example of the faux linen technique. Thanks to Rita H. and the TAC-niques group for these techniques. 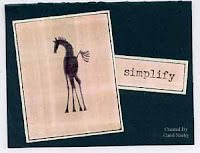 This card uses the Hieroglyph Horses, Live Inspired sets and glossy paper. I also used dark green and light green cardstock (a piece of scrap) and Palette Hybrid ink. This will certainly help pay my way to Seminar! Welcome to the age of technology!